Eliza Allen Sampler [D8910] - $18.00 : Yarn Tree, Your wholesale source for cross stitch supplies. Cross Stitch pattern from Mani di Donna. 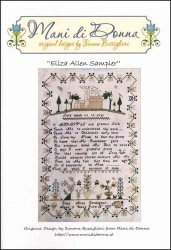 The "Eliza Allen Sampler" features a church with birds flying above at the very top of the design. Below is a saying that starts off with, "Lord teach us to pray." It goes on to say, "O merciful and gracious Lord teach me to understand thy word - teach me in childhood's early hour to love thy name to fear thy power to know that my redeemer gave his precious blood. My soul to save. O may I ever grateful prove for that amazing act of love should adverse storms obscure my sky then let me feel that thou art nigh or if prosperity be mine-----that's all which I possess is thime." Below the saying are flowers in flower pots along with birds, butterflies, etc. A floral border is stitched around this design to complete it. Stitched on #8219 Belfast Linen White 32ct. Stitch count is 295 x 441.